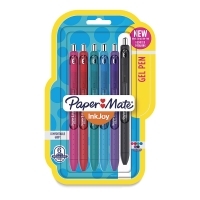 Paper Mate's revolutionary InkJoy writing system means effortless writing! The non-smearing ink in Paper Mate Inkjoy Retractable Ballpoint Pens means crisp, clean lines with no smudging. 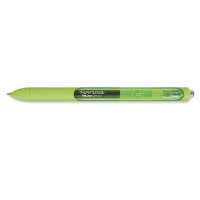 These colorful pens also have a rubberized grip that extends the pen length, and a see-through window that shows how much ink is left. Fashion Colors, Set of 14 — Includes 14 0.7 mm pens, one each of Berry, Black, Blue, Bright Blue, Cocoa, Green, Lime, Orange, Pink, Purple, Red, Slate Blue, Teal, and Yellow. 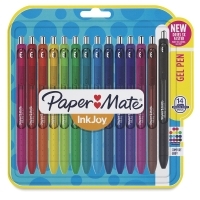 Student Colors, Set of 6 — Includes six 0.7 mm pens, one each of Black, Blue, Pink, Purple, Red, and Teal. 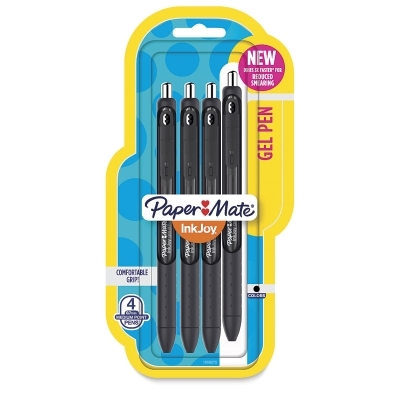 ® Paper Mate is a registered trademark.® Inkjoy is a registered trademark.